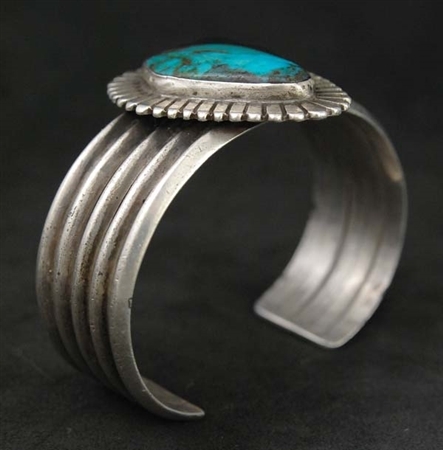 This stunning Bisbee turquoise bracelet was handcrafted by well-known Navajo silversmith Kee Joe Benally. Date of creation 1960's. 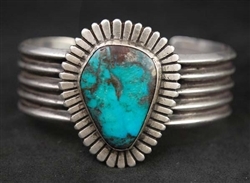 Award winning artist Kee Joe Benally was employed by Woodard's Indian Shop, in Gallup, NM for 15 years. His work was always very creative and masterfully done. A beautiful, natural Bisbee turquoise stone is set in a smooth bezel and framed with a beautiful silver fan design. A soft patina graces the entire piece. Kee Joe is no longer with us as he passed away in 2014. The top portion measures 1 3/4" wide (silver & stones) The inside measures 5 3/4" with a 1 1/4" opening. Slightly adjustable. 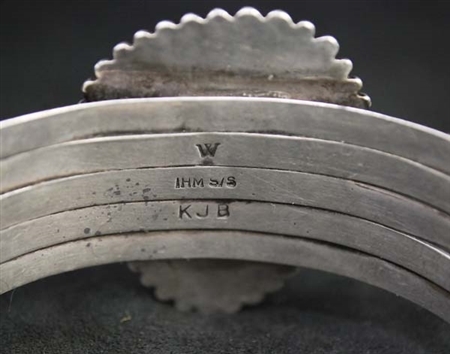 Hallmarked KJB, with Woodard's W IHM S/S hallmark.